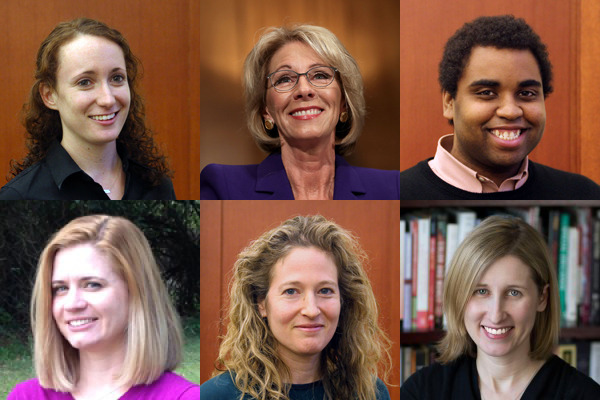 Clockwise from top left, Sarah Butrymowicz, Betsy Devos, Emmanuel Felton, Sarah Garland, Meredith Kolodner and Nichole Dobo. Sarah Butrymowicz: Hello everyone! May 17th marks Education Secretary Betsy DeVos’ 100th day on the job. The 100-day milestone, for better or for worse, has become a media favorite to gauge any new presidential administration. Since we’re keeping an eye on what’s happening (and not happening) at the Department of Education, I figured this was as good a time as any to check on what DeVos has done so far. I thought about making you all grade her in various areas, but decided that might be cheesy enough that you’d stage a coup and kick me out of the chat. Instead we’re going to focus some basic questions. What were DeVos’ best days and what were her worst? (Bonus points awarded if you can actually tell me which day a given event happened on.) And what does all this tell us about what the rest of her tenure will look like? Let’s start with the positive. What have her best days been so far? Meredith Kolodner: She came out early in favor of year-round Pell, which doesn’t increase the amount students get, just lets them use it during the summer. It has tons of support from students and colleges, and it gained bipartisan support in Congress as well. And it actually passed in the interim budget agreement. It was a rare bright bipartisan moment, which could make it easier for low-income students to earn a degree. Emmanuel Felton: April 20th (bonus points please), the day she toured the school in Ohio with United Federation of Teachers President Randi Weingarten, was a clear win for both Weingarten and DeVos. Even though they mostly talked past each other on issues like the deep budget cuts Trump has proposed and the desirability of school choice everywhere, the visit did seem to signal the end of the long war between the education department and the teachers unions over the school and teacher accountability issues that have dominated the relationship for the last 17 years or so. Sarah B: Emmanuel has been awarded one bonus point. Emmanuel: Wait, how are we keeping score? Sarah B: I’m making it up as I go. And yes, I think that visit was notable for how few headlines it made. If it would have been ugly, we would have heard a lot more about it. Meredith: Apparently all you have to do is ask and you get points. Although haven’t the teachers unions gone after her since then? Emmanuel: Sure, they are of course going to disagree a lot over the next four years, but I think it gave her administration an air of normalcy, that everything wasn’t going to be blown up. Meredith: That’s interesting, because it is true that she has been less aggressive in overturning things than people expected. Although I would say that getting rid of some of Obama’s student loan protections is pretty significant and went a little under the radar. Nichole Dobo: Meanwhile, key positions at the department remain unfilled. The Office of Educational Technology is without leadership, for instance. Sarah Garland: Isn’t that the goal though, for the education department to be less intrusive than before? Nichole: It’s hard to tell if it’s part of a plan or if they simply can’t find people willing to do the job. And, right or wrong, people look to the department ​for leadership. Liz Willen quotes people saying that in this story. Emmanuel: Sure, but the education department doing less was sort of written into the bipartisan Every Student Succeeds Act, right? There just isn’t an appetite for an active ed department in either party. Nichole: Good point, Emmanuel. But I’d argue the Democrats wanted the department to play an accountability role. Sarah B: I guess what counts as a “good” day is pretty subjective here. Getting rid of the student loan protections was viewed pretty poorly in a lot of circles, but may indeed have been a big win for DeVos. So what about her not-so-good days. What do you all nominate for “worst” days so far? Sarah G: Can’t not mention grizzly bears. It almost lost her the job. And I think it’s been a shadow over her ever since, even if we’re not talking about it anymore. Meredith: Her visit to Bethune-Cookman University went pretty poorly. She managed to get through her whole speech, but it sounded like most of the students weren’t very interested in listening to her. Emmanuel: Yeah, no question her worst day was the Bethune-Cookman speech, period. But there have been a lot of small defeats for Betsy DeVos and her school choice agenda. Many in conservative circles see her primary role as using the bully pulpit to advance school choice policies, but government-backed school vouchers for private schools, which is something she’s vigorously supported for decades, have really taken a beating recently. Study after study have shown that students at private schools using vouchers do no better and sometimes even worse than similar peers who remain in public schools. That helped anti-voucher lawmakers in Tennessee scuttle a voucher push there. After proposing bills each of the last seven years, pro-voucher lawmakers in that state thought that this would be their year. Lawmakers have instead promised to study how to best hold these private schools accountable and come back with a new bill next year. And that’s a state where Republicans control all branches of government. That underscores just how murky the path forward is for her policy agenda. The department banned gold standard research of vouchers under DeVos…after the department’s own research found poor results for vouchers. Emmanuel: Exactly. That didn’t look great and I think is having an effect around the country. In policymaking circles at least. Meredith: And of course…the whole HBCUs have been pioneers of school choice thing, oops, since in reality they were pioneers of resisting racism and segregation, which isn’t something they chose. Nichole: And going back to the staffing issue: She didn’t have a communications leader until very recently. Emmanuel: That’s been a problem for the entire administration. In its zeal to get conservative wins, they can be a bit tone deaf. The HBCU thing is a prime example, but the more troubling development is the conflicting messages from Trump himself about special funding sources for HBCUs and as Meredith has reported these schools, contrary to some conventional wisdom, actually do a really good job of getting their kids, particularly poor black students, across the finish line. Meredith: True Nickie. I can’t get answers to anything, for the most part. Also on choice, she got Trump to put side a lot of money in his proposed budget for school choice, so we may just be at the beginning of that train. Sarah G: With vouchers, HBCUs, etc., all of this builds on this idea of her as ideological rather than fact-based. She’s now dealing with this perception that she shoe-horns everything into the same narrative, whether it’s true or not. How do you get beyond that? Sarah B: Excellent segue into our final question! What do the first 100 days tell us about the next however many days there will be? Nichole: Will she be around much longer? That’s a real question sources have asked me. And I hope she’ll allow a veteran education journalist to interview her. This is more of a wish than a prediction, though. Sarah G: Cathie! Good reminder Meredith. I don’t think Betsy will suffer the same fate. There’s too much other stuff going on in Washington to worry about her occasional gaffes. Sarah B: I won’t pretend I have any idea how long she’ll be secretary, but I feel like it’s clear there is an uphill battle against public perception right now. (She was mocked on SNL – has that EVER happened before?) That combined with staffing issues likely means the department has a ways to go before it can be as effective as it might want to be. Emmanuel: I think the key moment of the last 100 days was the appointment of Candice Jackson to head up the Office for Civil Rights. Where this administration will stand on civil rights is really remains a big open question, but her appointment has a lot of people worried about the future of civil rights. While it was widely reported that Betsy DeVos tried to convince her colleagues to maintain the protections the Obama administration put into place for transgender students, she went to the Conservative Political Action Conference a few days later and defended the move, saying the Obama regulations were examples of federal overreach. This is exactly what has civil rights groups worried, that the administration will say it’s not the feds’ job to get involved in ensuring civil rights protections. And Jackson’s appointment only heightened tension. She has spent her career condemning feminism and programs designed to give minorities a leg up to correct for centuries of institutional discrimination. Besides her work on behalf of the women who say Bill Clinton sexually assaulted them, she has sued a university claiming that she was discriminated against because she was white and helped edit a book that attacked the Civil Rights Act of 1964. Sarah G: Right. I think you hit it, Emmanuel. The absence of the education department is what will be the most impactful in the next 100 days. It’s what they won’t do, not what they will do. Sarah B: And on that note, we’ll wrap up. Emmanuel wins with one point. *This article has been clarified to reflect the intent of Petrilli’s piece.